Facebook’s desktop version has long let you tag people in posts (similar to Twitter’s @ mention). A recent app update lets you do it on your iDevice too. 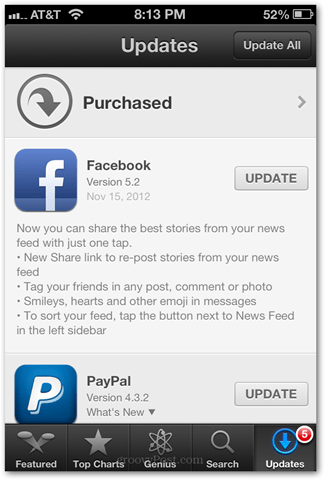 The iOS Facebook app for iPad, iPhone and iPod Touch rolled out with a new update on Thursday. Among these changes is a feature that lets you “tag your friends in any post, comment or photo.” The ability to tag friends in typical “status update” posts has long been possible on the desktop version of Facebook. But it has been conspicuously absent from the mobile interface. While the Facebook iPhone app would let you add people you were physically with, it didn’t support the Twitter-style @ mentioning. With the Nov. 15 update, you can. 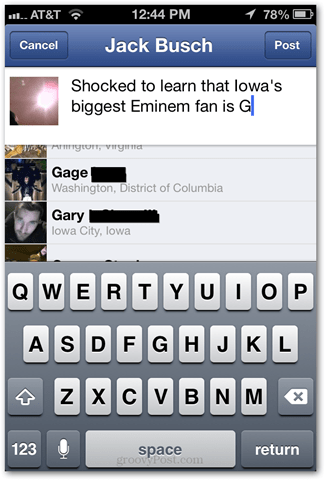 Read on to learn how to tag people in posts from the Facebook iPhone app. First off, update your Facebook iOS app if you haven’t done so in the last few days. After installing the Facebook iOS app update, not much will look different. 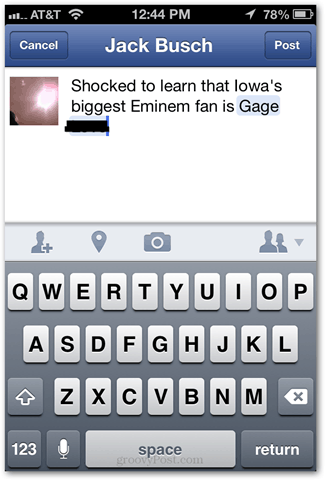 But when you begin typing the name of a Facebook friend into a post, a list of taggable friends will pop up. Tap the name to add them to your post. When you post the status update, the name will be a link to that person’s Facebook profile. Seems pretty basic, but why the heck did Facebook wait so long before rolling this out to the mobile app? 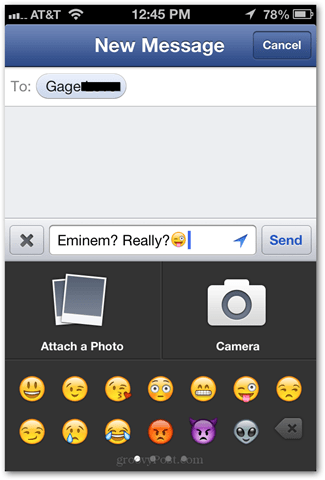 Another feature that might amuse you: new smileys, emoji and hearts in messages. These are only available in messages to your Facebook friends (not timeline posts or comments). To access them, tap the + button to the left of your text input field. Swipe left and right to see more pages of emoticons. Unfortunately, they have not yet added the look of disapproval ಠ_ಠ.